Kings Business is delighted to announce the sale of Mill Hill Stores in Enderby, Leicestershire. 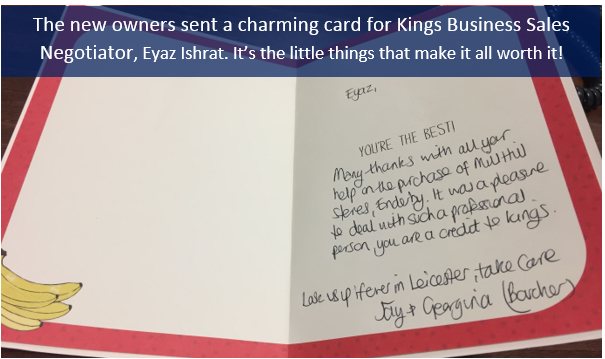 Kings Business contacted the owners of Mill Hill Stores as they wished to discuss the sale of their off-license business. After spending 20 years managing and growing Mill Hill, they finally decided it was time to move on to greener pastures. Kings Business is equipped with the expertise and knowledge needed to put the right buyers in front of our clients. After securing over 12 viewings for the business, Mill Hill had a grand total of eight offers come through for the business. After carefully reviewing each offer, the owners decided to sell the business to experienced entrepreneur, Mr. Jay Boucher. Mr. Boucher came from a background that gave him exposure and experience to the off-licence sector and proved to be a perfect fit for the business. Mr. Boucher was initially attracted to the business due to its location, located in the heart of Enderby. The business is popular with the local community and is situated on the side of a busy road, allowing for easy access routes to potential shoppers. The business itself has operated for over 70 years and is very well known in the local community. Mill Hill Stores operates as an off-license newsagent that sell a limited range of convenience foods, traditional beers, wines, spirits, confectionery, soft drinks, and tobacco lines. The property comprises of a two-story property that offers a shop floor on the ground level, as well as a four-bedroom accommodation on the floor above.